Born: December 1787, baptized 27 December 1787 and died November 17 1858. Son of: James Caldwell (1759-1838) and Elizabeth Caldwell (nee Stamford) (1754-1831). 1. Hannah Eliza Roscoe (nee Caldwell, 1785-1854) who married William Stanley Roscoe (1782-1843). 3. Anne Marsh Caldwell (1791-1874) who married Arthur Cuthbert Marsh (1786-1849). 4. Margaret Emma Holland (nee Caldwell, 1792-1830) who married Sir Henry Holland (1788-1873). 5. Catherine Louisa Caldwell, born 6 June, baptized 15 June 1794 and died 20 August 1814 aged 20. 6. Frances Caldwell, died 14 February 1801 aged 5. James Stamford Caldwell never married. 1. The diaries of his sister Anne Marsh Caldwell and his father James Caldwell. 2. Books on the Wegdwood family. 4. His books 'A Treatise Of The Law Of Arbitration' and 'Results of Reading'. 5. His portrait by Thomas Phillips RA. 7. A very large collection of documents at the Staffordshire Record Office including his will. 8. An entry in the book Alumni Cantabrigienses by JA Venn. Part II, 1752-1900, vol. I, Abbey-Challis, Cambridge, 1940, p. 490. This powder horn has the inscription J Caldwell 1776 and JSC 1803. It was in our family up until a burglary in 2000. It then turned up in an auction in America (Embassy Auctions International, Lee Jacob). I contacted Lee Jacob and requested that it be returned. I also stated that I would be happy to pay a reward so that no one lost any money over it. He said he did not believe that it was stolen. Dorset Police from here in the UK then contacted Lee Jacob and confirmed that the item was believed to have been stolen in the burglary and they requested that he return it. Lee Jacob still refused to return it. I then contacted the internet auction provider Artfact (Invaluable) and corresponded with Adrien Smith (Director of Customer Care). I asked them for the policy on auctioneers selling stolen goods via their website. It would appear that they do not have any real policy? I forwarded them a copy of the email from the police asking for the horn to be returned and they also refused to do anything about it. I also attempted to buy it on the day via telephone but just as I was about to bid Embassy Auctions hung up on me? I find this whole situation quite remarkable. If anyone on the internet wants to know more about this please contact me on jj@jjhc.info or call me on 44 1962 761 565. My position still remains the same in that I would be happy to pay a reward for the return of the item. For more information please click here . (Trusted to act with experience). 15 March 1813. At Stafford. . . . At these Assizes Stamford made his first essay as a Barrister. A Brief given him by Messrs Walthall & Ward in an undefended Cause in which he was . . . to himself and a Brief also given him by Mr Sparrow in the Navig. Cause. 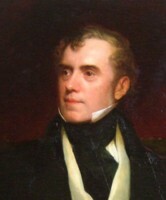 Upon the death of his father in 1838 Stamford inherited the family estate of Linley Wood. Stamford seems to have lived the life of a highly educated English Country Gentelman. He is mentioned briefly in the book "The Wedgwood Circle" as being a friend of the Wedgwood family. He had a very large impressive portrait of himself painted by Thoms Phillips RA. In addition to his library at Linley Wood, he also build up a fine collection of artwork, many of the items coming from the Stowe auction in 1848. A Digest of the Laws relating to the Poor. Published by J. Butterworth & Son: London, 1821. A Treatise of the Law of Arbitration. Published by J. Butterworth & Son: London, 1817. A Treatise of the Law of Arbitration. Published by J. Butterworth & Son: London, 1825. A Treatise of the Law of Arbitration. 2nd American edition. Published by Chauncey Goodrich: Burlington, USA, 1853. Results of Reading. Published by John Murray, London, 1843. Stamford never married. He died 17 November,1858, leaving a very unusual will which was very complicated. The original will was written 20 November 1840 however over the following 18 years he made changes and additions on 17 seperate occasions with the last amendment being 29 April 1858. Extensive legal paperwork relating to this will exists in the Staffordshire Record Office including a large summarising document (4229/4/1). There is also a document (4228/1-5) listing Stamford's property (land), the majority of which was a group of farms making up the Linley Wood estate but in addition there was property near Derby (Cannon Hills, Quarndon) and a large number of share holdings in a variety of companies. Stamford's will stated that the Linley Wood Estate would be held in trust. His sister Anne Marsh could live at Linley Wood for the rest of her life, as could any of her unmarried daughters. After that the estate would pass to the second son of his neice Mary Emma Heath and Leopold George Heath (later Lady Mary Emma Heath and Admiral Sir Leopold George Heath). After that the estate would be passed on down to the eldest son. The second son of Mary and Leopold was Frederick Crofton Heath, (later Maj Gen Frederick Crofton Heath-Caldwell) who was only a few months old at the time that Stamford wrote his last codicil. 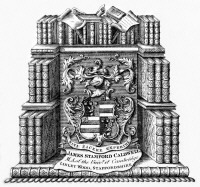 Stamford wrote in numerous conditions including that all the people in possession of Linley Wood would all have to add "Caldwell" as the last part of their surname. Hence Anne changed her surname to "Marsh-Caldwell" and Frederick changed his surname to "Heath-Caldwell" (when he finally inherited the estate 55 years later in 1913). Stamford's will also stated that these eldest sons, who would inherit the Linley Wood estate, must be properly educated so that they could take up professions. I understand that the will was contested, by some of the relatives. It was proved in the Court of Probate 18 months later in April 1860 with the effects recorded as being under �18,000. However this was not the last of the legal battles. Further legal disputes arose in 1862 and 1868 with Anne Marsh-Caldwell and the majority of the other relatives in dispute with her three unmarried daughters the Miss Marsh-Caldwells. 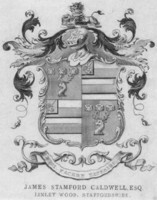 Further disputes also arose regarding a Derby property which had been given to one of the Roscoe family for his life only, after which it was to be returned to the person in possession of Linley Wood (4229/3/2). Like his father, Stamford's name is recorded on plaques in both St.Martin's church in Talke and in St.James's church in Audley. He is presumably entombed in the crypt in St.James.